What comes to mind when you hear the word “Texas”? For me, it’s cowboys, cowboy hats and boots. No self-respecting cowboy, cattle herder or ranch hand would be caught dead without a pair of sturdy boots on their feet. In that part of the country, it’s de rigueur. And H.J. Justin, the founder of the Justin Boots company, knew that. A boot repairman from Lafayette, Indiana who landed in Spanish Fort, Texas in 1879, he outfitted cowboys on their way up the Chisholm Trail with boots made right in the comfort of his own home. Even his wife got in on the business, developing something they call a “fit kit”, which was basically just a chart and a tape measure. Armed with these two items, cowboys already wearing H.J. Justin’s boots spread the word and the company grew. Eventually, H.J.’s sons joined their dad and it became a true family run business. If you’d like to know more about the history of the company, you can check it out here. The reason I’m telling you all of this? Well, I have a little surprise for you. What could I possibly have that you want, you say? Well, other than the recipe for my mother’s famous Eggplant Caponata? I have a pair of boots. That’s right, people…BOOTS!! Justin Original Workboots has come to The Daily Rant, and they’re giving me a pair of workboots to pass along to one of my lucky readers. For FREE!! I gotta say, for a flip-flop girl, I’m flippin’ excited about this. 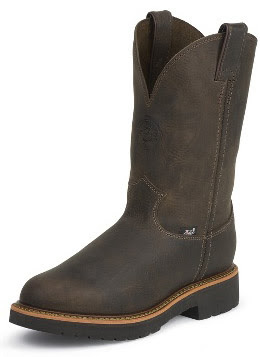 I’ll be giving away one pair of boots to one of my readers (to be chosen from comment entries on both The Daily Rant and Life On The Road) in addition to getting a pair for myself and a friend, which will be used for a future product review. The friend I've chosen to be the recipient of those boots is someone I've known for over twenty years, and who's owned his own construction company for even more years that that. He wears boots daily; climbing ladders, walking over debris on jobsites, standing for hours on end at his shop. He actually wears them out. Once he’s given them a good beating, I’ll be asking him what he thought; about fit, comfort, style, etc. Everything one cares about when wearing a workboot. As a fellow native New Yorker, I know he’ll have no problem telling me exactly what he thinks. Then, once fall hits, I’ll be hanging up my flip-flops and giving you my personal opinion on the boots I choose. I already know which pair I want. If you’ve followed my blog for any amount of time, you know I don’t hold back with my opinions. If the boots pinch my toes like a too tight stiletto heel, you’ll be the first to know! The J-Max Collection is handcrafted right here in the United States of America!! That’s kinda rare these days, isn’t it? And the boots today are made to the same high standards set over 130 years ago by H.J. Justin. Can’t beat that, can you? 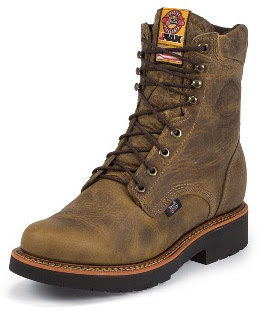 Also, and this is really going to thrill some of my readers, a portion of the proceeds from the sale of the J-Max Original Workboots are going to Camp Patriot. Camp Patriot provides the opportunity for disabled veterans to go on outdoor adventures – everything from fly-fishing to archery to kayaking to snowmobiling to climbing Mount Rainier! There are more than 2.3 million disabled veterans in the United States today, people who lost the ability to pursue some of their dreams due to injuries suffered in the line of duty. So not only can you help support someone who has dedicated a portion of their life to the military by buying a boot from this line, but you’ll be wearing an American made pair of boots to show for it! In addition to the boot giveaway here at The Daily Rant, Justin Original Workboots is having a Dirtiest Workboot Contest (Wow, a contest within a giveaway?! Who woulda thunk?). They're asking fans to submit photos or video of their dirtiest workboots and whoever gets the most votes will win a year's supply of Justin Original Workboots and RIGGS WORKWEAR by Wrangler- they've figured that up to be six pairs of boots, six pairs of pants and six shirts. So go get dirty, people! Please take a moment to check out the Justin Original Workboots website, their Facebook page and also their Twitter feed. Between these three locations, you won’t miss a minute of what Justin boots is up to! It doesn't matter if it's a city, state or your backyard tree swing. Just tell me where it is and why you like it. If you're a trucker, do you have a favorite state? If you travel for work, is there a spot you always visit when you're in a particular town? Are you a family that does yearly vacations in the same spot since childhood? Do you get away from it all in a hammock in your backyard, book in hand? Just let me know the place that makes you happy and you're automatically entered into the giveaway. Easy like Sunday morning. PLEASE NOTE: You will need to have a VALID EMAIL ADDRESS to enter. I don't care if it's FakeCowboyEmailForTheBootGiveaway@bigfaker.com, as long as I can contact you for shipping information should you be our winner. Don't make me have to hunt you down. FOR AN EXTRA ENTRY: Become a fan AND leave a comment (it can be your same favorite place or a different one) on The Daily Rant Facebook Page and you'll get a second entry. Please don’t forget to include your email address! CONTEST DURATION: The contest will start today, August 4th, and run until Thursday, August 18th. Any comments left during that time period will be entered into the drawing for the FREE pair of Justin J-Max Original Workboots. CHOOSING A WINNER: The winner will be selected at random and be announced here on Friday, August 19th. Once the winner has been chosen, they will be contacted for their address information and Justin Original Workboots will send the boot of your choice from the J-Max collection right to your front door. They'll be on your feet in no time! My yard looking at all of the different wildlife passing through. Favorite place right now is up in the campagna/countryside feeling the breeze among the olive trees :) Great giveaway! The Highlands of Scotland. The peace and tranquility are beyond compare. Words can not do it justice. My favorite place is digging in the dirt in my yard. It is a simple pleasure that makes me feel balanced and whole. I can sit in my yard for hours and weed, or plant, and be oblivious to the chaos around me. My favorite place? In the passenger seat of a Semi sitting next to my husband. No greater feeling than that on earth! My favorite place is HOME. After a long week or 2 on the road of driving, I love the feeling of going home! Can't pick one, Oxford England and the country villages, my nephews farm in Lakeside Oregon, Cape Cod,NW Arkansas, Jackson Hole Wyoming, the Badlands, so many places and so many more i want to see.Can you pick just one Selena? My favorite place is anywhere that has my two precious grandsons by my side...but to name one. When they are snuggled in for the night watching a movie and eating popcorn with Nonna! Anyplace in the woods in Pennsylvania (I guess theoretically some other states would be okay! ), next to a stream, where I can just sit and listen to the birds and the water flowing over the rocks. In fact, this is where I'd like to be scattered someday when all my useful parts have been donated and the rest is a fine gray powder. My favorite place... Home. Whether it be on the road truck cab, a place that you grew up, or new construction, there's no greater feeling than home. How incredibly super neat is this!! Best trucking blog ever!! Ok, ok..my favorite place is The Rainbow River in Dunnellon, Florida. Your troubles and concerns simply melt away as you float down that crystal clear spring. It's relaxation at its best! My favorite place is home after we have been on the road for awhile. There is nothing like going home and unlocking the front door and walking through the house after we have been away. My favorite place in the world is London, England. The first time I was there, it felt like home, and every time I've been there since - the pull to live there on a permanent basis gets stronger. It is the perfect mix of new and old, while the people I have met there are warm and welcoming (actually, they're warm and welcoming throughout the UK). My favorite place is the town I now live - Bury St Edmunds, England. I moved here from Phoenix, AZ a year ago. I love Bury because my entire family is here, there are about 30 of us in town. Everyone is within a 10 minute walk from my house, there is a farmer's market twice a week that completely closes the center of town, and there are so many places to take my dog Peanut for a walk! Cape Henlopen State Park, Delaware. The Delaware seashore has always been a 'big deal' to me. When we were kids, my brother and I would count down to when Mom would take us to the beach. Back then, she was just starting out in the real estate business, newly divorced (in the 70's!) and going to the beach meant we made it thru another year. We stayed several blocks off the beach for years, and as she worked and became a little more successful, we stayed closer and closer to beachfront. It was hard for her, and for us, although we didn't know we were 'poor', it was just one of those things. But once a year, for a week, we were RICH. I still go back to the beach with Mom, (beachfront) but at least once a year, I stay in a tent at the campground at Cape Henlopen state park. It's in a pine forest, with sandy campsites, and there is no place I'd rather be than sitting in a beach chair, feet in the sand, around the campfire, listening to the waves in the distance. I've been doing this for a couple years now, and it never gets old. I find a peace in myself that is buried by noise, stress and general daily life. It's like being reborn every summer, so I know I can go on for another year. Boots? I'm just a big old boot 'ho. Love 'em. Wear 'em all winter. Thank you. of course you know our favorite place is home...lost creek, wv!..we have many other places we love to spend time but nothing beats lost creek! Beacause it looks like I can't say, The Shoe Store. I'll say that my fav place in the world starts with sand and ends with ocean... the name changes all the time. The world is big, our lives too short, to not try it all out, right? Right now, I'd say the Gulf Coast of Florida, as it's close enough for a quick weekend escape and has the most beautiful beaches in USA. At the dinner table surrounded by my 3 kids and their chatter about their day. I love to sit back and just appreciate the absolute blessings that God has given me. It's the best thing I have ever done - being a Mom and it's the best gift anyone could ever have. My favorite place is Salamonie Resevoir Campground! I truly enjoy the away time with my husband and children!! My favorite place is the Texas Hill country -- places like Kerrville, Bandera or Fredericksburg - great food, great scenery and great entertainment. Plenty of varied responses. This is a good way to see where your followers are coming from. It reminds me of Don Imus, rest in peace brother Fred, when he started selling calenders and Auto Body Express apparel! My favorite place is the Atchafalaya Swamp. I love the smells and watching the sun go down over the water. My favorite place is in my wife's arms, where I'll always belong! I liked your Facebook page and left a comment there to let you know my favorite place is New York!! Paris - it's simply the most beautiful, romantic city I've visited (3 times & hoping for many many more!). Thank you for entering! We have a slight change in the date when the winner will be announced. I am currently out of the country. Why does that matter to you? Well...because I did not take my laptop with me (I only have my netbook), and all of the entry information, from all areas where people were asked to enter, is on the laptop. Grrrr! Soooo....there will still be a winner (of course), but they won't be announced until after September 1st. I'm SO sorry for the delay. But oooh, think of the suspense!